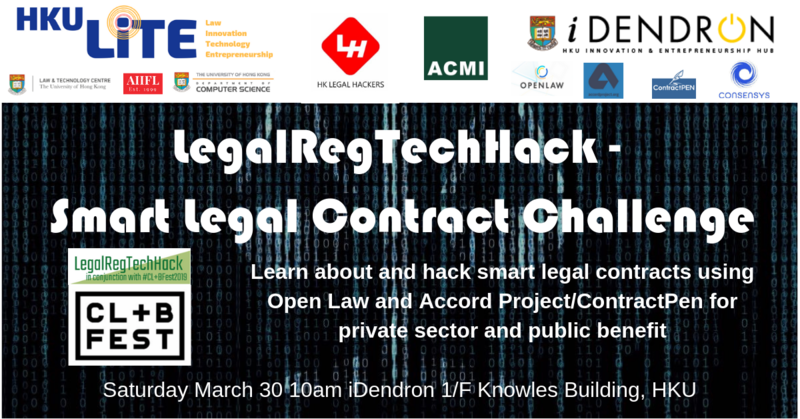 LITE Lab@HKU is organising a LegalRegTechHack - Smart Legal Contract Challenge on March 30 at iDendron, and most welcome all learners and legal hackers to participate! Non-coder law and other students and lawyers as well as expert hacker computer science students and programmers are most welcome! • Hands-on instruction with Accord Project using Hyperledger and no code smart legal contract builder ContractPen. We then invite participants to work in teams to creatively hack to improve private sector legal service delivery and public benefit, and share their creations at the end of the day. For those teams who want to further develop their projects, iDendron is making their space open for interested teams on Sunday too. Special prizes may be available for the most innovative projects!